American actor, singer Bob Henry died in Arlington, Texas on May 22, 2016. He was 80. Born in Port Arthur, Texas as Robert H. Hensley on April 24, 1936, he was first a recording artist under the alias Jericho Brown and released a single called ‘Little Neva’ followed by 17 other singles one of which ‘Reach for a Star’ reached #1 in England. 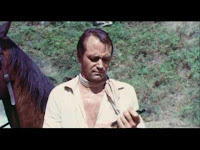 Then in 1967 he went to Rome and appeared as Bob Henry in “A Colt in the Hand of the Devil” directed by Sergio Bergonzelli and co-starring George Wang. In 1973 he married actress Pamela Baird who was a TV actress who appeared as Mary Ellen Rogers, Wally Cleaver’s girlfriend, in the ‘Leave it to Beaver’ TV series. Bob and Pam had five children and six grandchildren.